The present monitoring and assessment of the chemical status of water bodies fail to characterize the likelihood that complex mixtures of chemicals affect water quality. The European Collaborative Project SOLUTIONS suggests that this likelihood can be estimated with effect-based methods (EBMs) complemented by chemical screening and/or impact modeling. These methods should be used to identify the causes of impacted water quality and to develop programs of measures to improve water quality. Along this line of reasoning, effect-based methods are recommended for Water Framework Directive (WFD) monitoring to cover the major modes of action in the universe of environmentally relevant chemicals so as to evaluate improvements of water quality upon implementing the measures. To this end, a minimum battery of bioassays has been recommended including short-term toxicity to algae, Daphnia and fish embryos complemented with in vitro and short-term in vivo tests on mode-of-action specific effects as proxies for long-term toxicity. The likelihood of adverse impacts can be established with effect-based trigger values, which differentiate good from poor water quality in close alignment with Environmental Quality Standards for individual chemicals, while taking into account mixture toxicity. The use of EBMs is suggested in the WFD as one avenue to establish the likelihood of adverse effects due to chemical pollution in European water systems. The present paper has been written as one component of a series of policy briefs to support decisions on water quality monitoring and management under the WFD. In line with the EU strategy for a non-toxic environment , the Organisation for Economic Co-operation and Development (OECD) Council Recommendation on Water  and the Sustainable Development Goals by the United Nations , protecting water resources from contamination with toxic substances is a major task of water quality assessment and management. Water quality assessment according to the European Water Framework Directive  is presently based on chemical analysis of 45 Priority Substances (PS)  to assess the chemical status together with different sets of River Basin-Specific Pollutants (RBSP) defined nationally, currently a total of approx. 300 in the different EU member states. It has been demonstrated that these substances reflect only a (site-specific and typically unknown) fraction of the overall chemical risk  and mixture risks are not considered. Thus, the current approach is insufficient to estimate the likelihood that chemical contamination causes harm to human health or aquatic ecosystems, and to develop programs of measures to reduce chemical pollution impacts. In the WFD, chemical pollution is defined as any chemical or mixture that poses harm (Article 2). European surface waters contain tens to hundreds of thousands of chemicals including pesticides, biocides, pharmaceuticals, surfactants, personal care products and many more together with numerous transformation products. These chemical cocktails may pose a risk to ecosystems and raise concerns for human health if water resources are used for drinking water production, fishing and recreation. The focus on PSs and RBSPs encourages reduction in their use, but replacement of these substances by alternatives that pose similar hazards is an unresolved problem. Chemical monitoring of a few selected individual chemicals is and will increasingly be less informative for identifying the likelihood that chemical mixtures pose harm, whilst the probability of overlooking significant risks is high and increasing. As a result of the application of management measures, prioritized chemicals tend to be replaced by non-prioritized (non-regulated) ones that have often similar effects. This process increases the relative contribution of non-prioritized chemicals to the overall risk. A strategy that would focus on monitoring the concentrations of all chemicals on the market would practically fail. The logical solution for taking into account missing, and potentially harmful, chemicals would be to use integrative methods to evaluate the likelihood of complex mixtures causing harm. Thus, the challenge is to characterize chemical pollution in a comprehensive way with limited resources, such that the impact of chemical pollution can be diagnosed, that risks to ecosystems and human health can be prevented, that resources for safe drinking water production can be protected with limited treatment costs, and that improvements through programs of measures can be monitored. For linking chemical and ecological status. In vitro assays addressing specific modes of action (MoA), such as specific assays addressing endocrine disruption, mutagenicity and activation of cellular defense mechanisms. Apply sample enrichment before applying EBMs to separate organic micropollutants from other matrix components and to increase sensitivity of EBMs so that robust data based on concentration-effect models are derived and detection limits for hazardous chemicals equivalent to Environmental Quality Standards (EQS) of PS and RBSP are achieved. Adopt regulatory frameworks supporting EBM application for diagnosing whether or not complex mixtures are impacting water quality and for monitoring in a way that not only addresses currently established effects but also allows for tackling endpoints of emerging concern. This is necessary since it may be expected that opening monitoring for EBMs will trigger the development of new cost-efficient methods that will address MoAs that are not yet covered. Use EBMs for identifying the need for abatement measures and assessing their efficiency. If EBMs indicate unacceptable risks, decisions on measures can be taken without knowing the individual drivers of the risk. Examples are the observation of enhanced toxicity downstream of the discharge of effluents that may be abated with improved treatment technologies using advanced oxidation processes or activated carbon or toxicity abatement downstream of agricultural areas by applying extended buffer strips along the stream. The comparative application of EBMs upstream and downstream the discharge indicates the success of the measure in a cost-efficient way without the identification of individual chemicals. Moreover, the WFD suggests combining Lines of Evidence, whereby EBM results can be combined with other approaches such as emission inventories, pollutant concentration measurements and ecological monitoring data. Use effect-directed analysis (EDA) if EBMs indicate unacceptable risks that are expected to be driven by site-specific chemicals for example from industrial processes that should be better avoided or treated at the source rather than with end-of-pipe treatment. A comprehensive overview on available EDA tools is available . Combine EBMs with chemical analytical screening at priority sites for the identification of important risk drivers at a larger scale, contamination trends, newly emerging chemicals and spills to prioritize chemicals for regulation and as integrated early warning tools for upcoming pollution problems. The design of a roadmap to support the consistent and useful implementation, and interpretation of EBMs for the purposes of the WFD, covering both the use of EBMs to diagnose the impacts of complex mixtures on current water quality as well as to improve surveillance, operational and investigative monitoring of complex mixtures in European water bodies. A wide range of EBMs has been applied successfully for both diagnostic and monitoring purposes to assess the likelihood of impacts of chemical pollution, most of them in a scientific development context for establishing robust and meaningful EBM-tools. These activities provided substantial progress towards the compilation of a useful battery of bioassays. First, a comprehensive analysis of about 1000 typical water contaminants identified 31 major MoA categories while for a substantial fraction (37%) of the compounds no information on MoAs was available . Second, MoA-specific in vitro assays fit for the purpose of environmental diagnosis and monitoring are available for receptor-mediated endocrine effects, genotoxicity and mutagenicity, activation of metabolism, adaptive stress responses, photosynthesis inhibition and cell line-specific cytotoxic effects [10–12]. 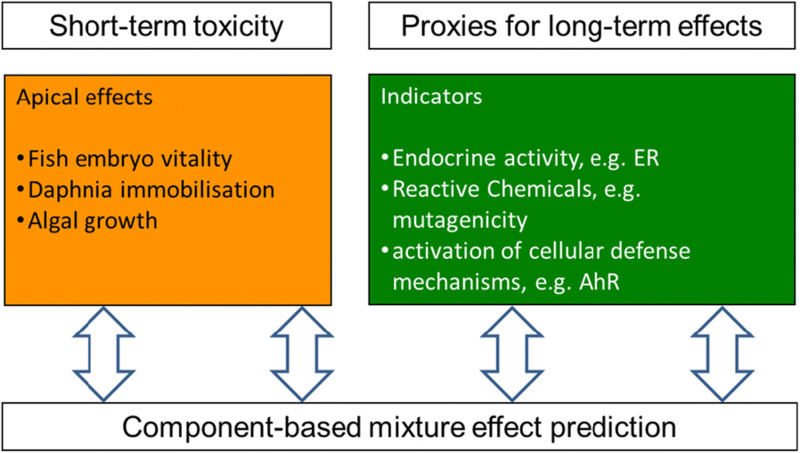 Thus, in vitro assays address well-described MoAs with known environmental relevance as proxies for long-term effects, although not all potentially relevant effects are covered with present test systems. To also cover chemicals with unknown and non-specific MoAs as well as with MoAs that cannot be addressed with existing MoA-specific in vitro assays and to detect specific impacts on the WFD-Biological Quality Elements, it is recommended to complement these assays with apical short-term toxicity bioassays representing at least fish (fish embryo toxicity), invertebrates (immobilization of daphnia) and algae (inhibition of cell multiplication), which represent BQEs for pelagic communities in WFD (Fig. 1). Amongst the MoA-specific in vitro assays, priority of application should be given to endocrine disruption and mutagenicity. Dioxin-like effects should be analyzed particularly in sediments , biota  and equilibrium passive samplers , since typical drivers of these effects are very hydrophobic and accumulate in these matrices. In SOLUTIONS and the NORMAN network, we proposed a test battery of in vitro and in vivo bioassays and published standard operating procedures [12, 16]. The utility of EBMs is found in both the diagnosis and assessment of impacts on ecological status (cf. WFD Annex II) and the monitoring water quality status and trends (WFD Annex V). Solid-phase extraction (SPE) was found to be a suitable sample preparation method for environmental water samples that are to be tested in the aforementioned bioassays, with effect recovery by current SPE methods similar to recovery of individual chemicals by chemical analysis . While sample enrichment is always restricted to an application domain with respect to the physicochemical properties of the chemicals, the “effect recovery” experiments indicated that for the typically applied co-polymer sorbents this domain is sufficiently broad to extract a large share of the overall toxicity of organic chemicals in water . Metals and other inorganic chemicals are not addressed and need to be monitored separately. A robust mobile large-volume SPE has been developed for the use in the field, which avoids the transportation of large water volumes to the laboratory for enrichment  and allows for time-integrated as well as event-based sampling. Equilibrium passive sampling may be useful to concentrate hydrophobic chemicals in a biomimetic manner for subsequent EBM application . For screening purposes, samplers for more hydrophilic compounds can also be used [15, 19]. In SOLUTIONS, EBMs were applied in a series of case studies, where it was possible to characterize the likelihood that complex mixtures present in water systems pose specific (MoA-related) harm to the Biological Quality Elements, along a river stretch , around wastewater treatment plants [21, 22] and close to inflows of untreated wastewater . For the selected types of example sites, mutagenic, estrogenic, androgenic and anti-androgenic effects could be established as markers for the likelihood that treated and untreated wastewater affects aquatic life. In addition, the methods allowed the impact of wastewater effluents on surface water quality to be estimated and the overall effects of chemical pollution on aquatic life and thus water quality to be assessed. The methods helped identify damage and associated causes (diagnosis, Annex II) in support of water quality management. Examples are the detection of strong anti-androgenic effects in the River Holtemme (Germany) and the identification of the fluorescence dye coumarin 47 as the cause of this effect , the detection of mutagenicity in the Rivers Mulde and Rhine and the identification of diaminophenazines  and synergistic effects of aromatic amines with natural alkaloids  as mutagenicity drivers. These examples may also underline how monitoring (Annex V) with EBM’s can help evaluate status and trends. Quality/performance criteria for the benchmarking of estrogenicity bioassays have been recently investigated in an inter-laboratory comparison study . In a Europe-wide demonstration program supported by SOLUTIONS, the NORMAN network, the Swiss Centre for Applied Ecotoxicology and the Joint Research Centre of the European Commission, the reliability of EBMs for screening of estrogenic compounds was analyzed to harmonize monitoring and data interpretation methods, and to contribute to the current WFD review process. Surface water and wastewater samples were collected across Europe and analyzed using chemical analyses and EBMs. The study demonstrated that the inclusion of effect-based screening methods into monitoring programs for estrogens in surface waterbodies is a valuable complement to chemical analysis because of the lower LODs of the EBMs in comparison to chemical analysis [27, 28]. Based on the results and achievements of SOLUTIONS and the NORMAN network, such comprehensive case studies should also be performed for other modes of action. Effect-based trigger values (EBT) have been developed for many EBMs. EBTs are expressed as bioanalytical equivalent concentrations (BEQ) and can be read across from existing EQS values for single chemicals. EBTs basically define an acceptable level of effect (translated into EBT-BEQ), in close alignment with the WFD protection goals and concentration-based Environmental Quality Standards (EQS), which proved to be useful for interpreting EBM-results in relation to the likelihood to pose harm [28, 29]. Bioassay-specific EBTs were derived by translating individual annual average (AA)-EQS for single dominant chemicals such as estrogens into EBT-BEQs [26, 28, 29], by ecological considerations and application of species sensitivity distributions  or by reading across from all existing EQSs using a transparent algorithm that does not require any user assumptions or judgements about the data . The latter EBT-derivation method targets undefined mixtures acting according to a specific MoA. In contrast to EQSs, EBTs consider all chemicals in a mixture contributing to measured effect. Thus, this approach does not require individual guideline values for all mixture components of a mixture. Bioassay-specific EBTs are key for the interpretation of results from water quality assessment, as effects below the corresponding EBT indicate a low likelihood that the chemical mixtures pose harm whilst exceedance implies increasingly clear indications for harm to aquatic life. Importantly, the proposed approach can be applied to any bioassay provided there are sufficient effect data available. WB has been responsible for the concept of the manuscript and drafted the manuscript. BE, HH, LP and RA helped to further elaborate the manuscript and contributed specific aspects. All authors read and approved the final manuscript. This article has been prepared as an outcome of the SOLUTIONS project (European Union’s Seventh Framework Programme for research, technological development and demonstration under grant Agreement No. 603437). G.A. Umbuzeiro thanks FAPESP Projects 2013/16956-6 and 2015/24758-5.